This sweet, lightly spicy, and citrusy recipe for Pineapple Shrimp Kabobs was originally inspired by a trip to Louisiana. Since then, it’s become a regular on our warm-weather dinner menu. Shrimp kabobs are easy to customize to include different fruits and vegetables, you can cook them on the grill, stovetop, or in the oven, and the shrimp marinade is just FIVE ingredients! Rather than miss out on the easy, healthy, and indisputably delicious genre that is grilled food, I decided to pick up my skewers and learn to grill myself. Kabob recipes were the very first I learned to master, because they are among the most simple, and the results are consistently superb. Fajita Chicken Kabobs were my first foray into skewer-style cooking, soon followed by Grilled Pesto Chicken Skewers (DEAD EASY), and these peppy Grilled Orange Chicken Kabobs. Eventually, shrimp kabobs came into the mix. SOLD. No matter how many dozens of skewers I flip, shrimp kabobs are the ones I find myself returning to most. Shrimp kabobs cook in a matter of minutes, they are easy to transition to your oven or stovetop if you don’t own a grill (or if it’s chilly or raining outside and you don’t feel like braving the elements to use it), and, because shrimp are mild, they pair well with just about any combination of fruits, vegetables, and even sausage you care to add to them. To get us good and ready for the easy, breezy summer living that’s surely ahead, today I’m sharing my go-to shrimp kabob marinade and skewer additions, along with a few ways to switch it up. Cool, Creamy Coconut Milk. To make the shrimp extra juicy and balance the heat from magic Ingredient #5. Fresh Lime Juice and Fresh Orange Juice. To turn the shrimp kabobs into summer gold on a skewer. Soy Sauce. To provide essential saltiness. I like soy sauce in place of plain-old kosher salt here, because its flavor is more complex and balances well with the sweetness of fruit you may add, like pineapple. Tabasco. To be the somethin’ somethin’ and give the shrimp kabobs a Cajun edge. Made in the heart of Louisiana (I came up with this recipe shortly after visiting the factory! 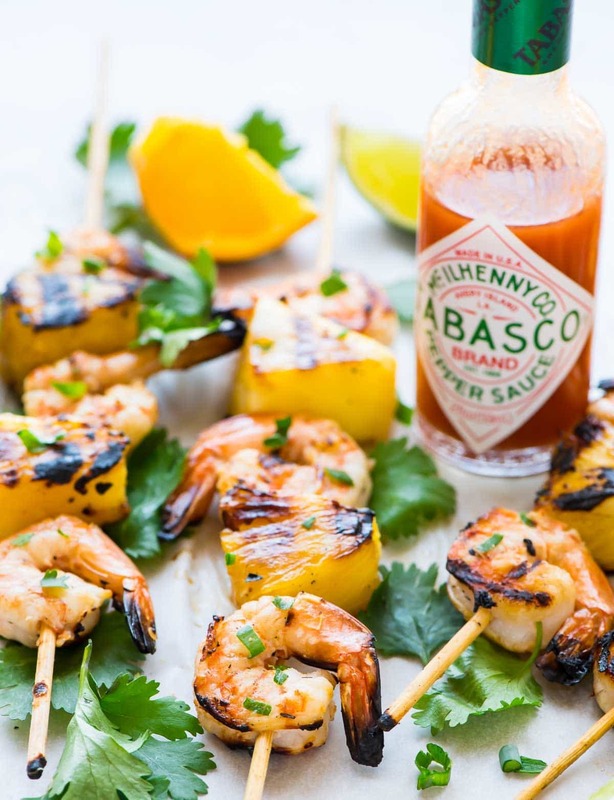 ), Tabasco adds the right amount of heat to unite the rest of the ingredients, and its spice will cause you to reach for “just one more” shrimp skewer…three times in a row. If you are looking to season the shrimp kabobs with a dry spice blend rather than a wet marinade, you can check out my all-purpose Grilled Shrimp Seasoning. It uses simple pantry ingredients like Italian seasoning and cayenne and is another keeper. Pineapple. 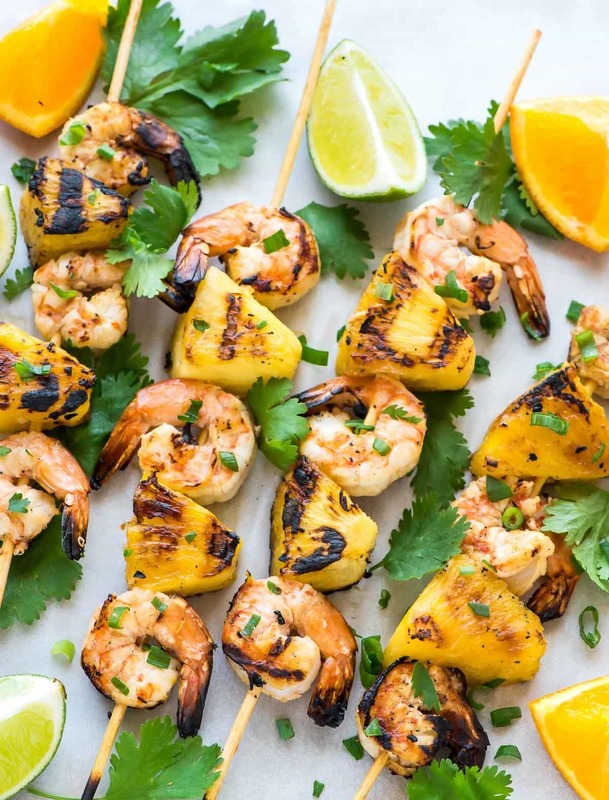 I know shrimp kabobs with fruit might sound a little odd, but pineapple shrimp is dreamy, especially with this marinade. If you only add one other item to these shrimp kabobs, make it this one. Mango. Another tasty tropical option. 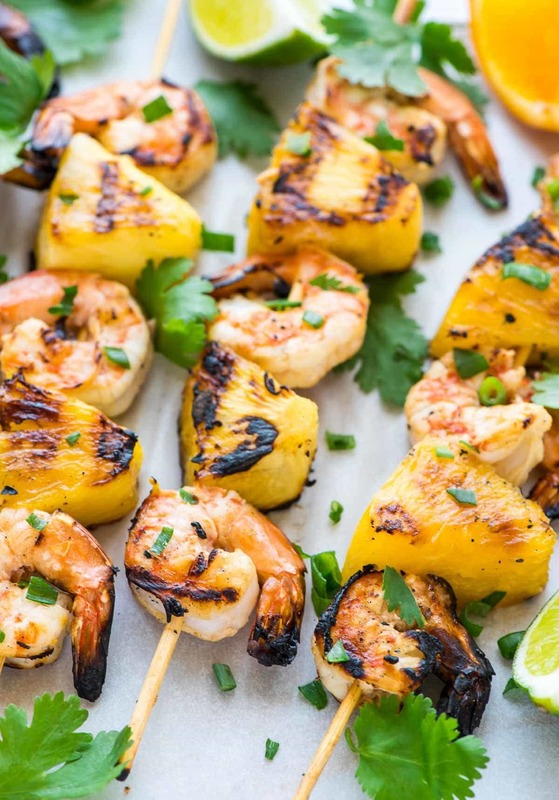 Shrimp kabobs with pineapple and mango would be particularly summery. Vegetables. You can use almost any kind you like for shrimp and vegetable kabobs, as long as it is it somewhat “soft” and easy to spear. My favorite is Hawaiian Shrimp Kabobs with a mix of red peppers, pineapple, and red onion. We like mushrooms and zucchini too. Sausage. For a meaty, Cajun twist, try shrimp and sausage kabobs! Cut precooked andouille sausage into coins the same thickness as the shrimp, tucking them into the shrimp’s curve so that the shrimp wraps around the outside. Thread onto the skewers together. You can cook shrimp kabobs on any kind of grill: charcoal, gas (what we have), Traeger, Green Egg, and yes, even George Foreman (shout out to my first apartment!). Here are a few tips to keep in mind. If you are using wooden skewers with any open flame, be sure to soak them in water for at least 30 minutes first so that they do not burn. Heat the grill to high, around 450 degrees F.
Cook the shrimp for a few minutes on each side, just until they are pink and opaque. This can happen in as few as 2 to 3 minutes per side, so don’t walk away! Let the shrimp cool a few minutes, then serve. You can either set the skewers directly on plates or carefully remove the shrimp from the skewers prior to serving. If using metal skewers, be careful not to touch them directly. If you don’t have an outdoor grill, are out of fuel, or the weather isn’t cooperating, you can easily cook shrimp kabobs in your oven instead. Preheat the oven to 450 degrees F. Lightly coat a baking sheet with nonstick spray. Place the threaded skewers onto the baking sheet. Place into oven and roast just until pink, firm and cooked through, about 5 to 7 minutes. No outdoor grill and your oven is on the fritz or occupied with other food? No problem! Here are tips to cook shrimp kabobs on the stove. Use a stovetop grill pan like this reversible one or this skillet/grill combo. You won’t have the same smoky flavor that you get from an outdoor grill, but your shrimp will still be ultra tasty. A simple green salad like this Arugula Salad or this Spinach Strawberry Salad. Extra skewers of grilled veggies. A grain like rice. I recommend brown rice, as it is whole grain and more filling. Cauliflower rice is an excellent option if you’d like to keep the meal more low carb. Double prong grill skewers (this is what we use the most often). I used simple wood skewers for the photos. Non-slip mixing bowl (for marinating the shrimp). I will warn you: these Coconut Pineapple Shrimp are habit forming. They deftly combine salty-sweet flavors, and the hot sauce is subtle. It won’t burn your mouth and slow you down, but as you devour shrimp kabob after shrimp kabob, you will slowly begin to realize that it was the kick that kept you munching all along. If you prefer more heat, feel free to up the amount of Tabasco in the shrimp marinade, or follow my grammy’s lead at our family dinners and set the bottle on the table for guests to sprinkle on as many dashes as they dare. These grilled shrimp kabobs delight without overwhelming, won’t monopolize your evening (they cook in fewer than 5 minutes), and are an ideal recipe to share with family and friends. 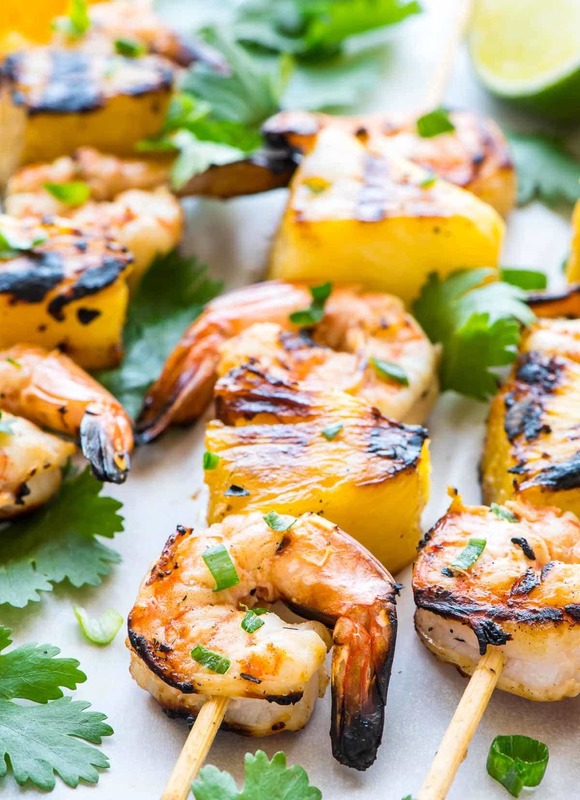 Grilled Pineapple Shrimp Kabobs with an easy citrus shrimp marinade. The best way to cook shrimp! Works for the oven, stovetop, and outdoor grill. In a medium bowl, combine the coconut milk, Tabasco sauce, soy sauce, orange juice, and lime juice. Add the shrimp and toss to coat. Cover and place in the refrigerator to marinate for 1-2 hours, tossing occasionally. If using wooden skewers, soak in warm water while the shrimp marinates. Meanwhile, prepare the pineapple if needed. Preheat the grill to medium high heat. Remove the shrimp from the marinade, and reserve the marinade for grilling. Thread the shrimp onto a skewers, alternating with the pineapple. Lightly brush the grill with canola oil, then place the shrimp on the grill. Grill the shrimp for 3 minutes, brushing with the marinade, then turn and cook for an additional 2-3 minutes, brushing with the marinade again, until the shrimp are just cooked through. Remove to a serving plate and garnish with cilantro and green onion. Serve hot. 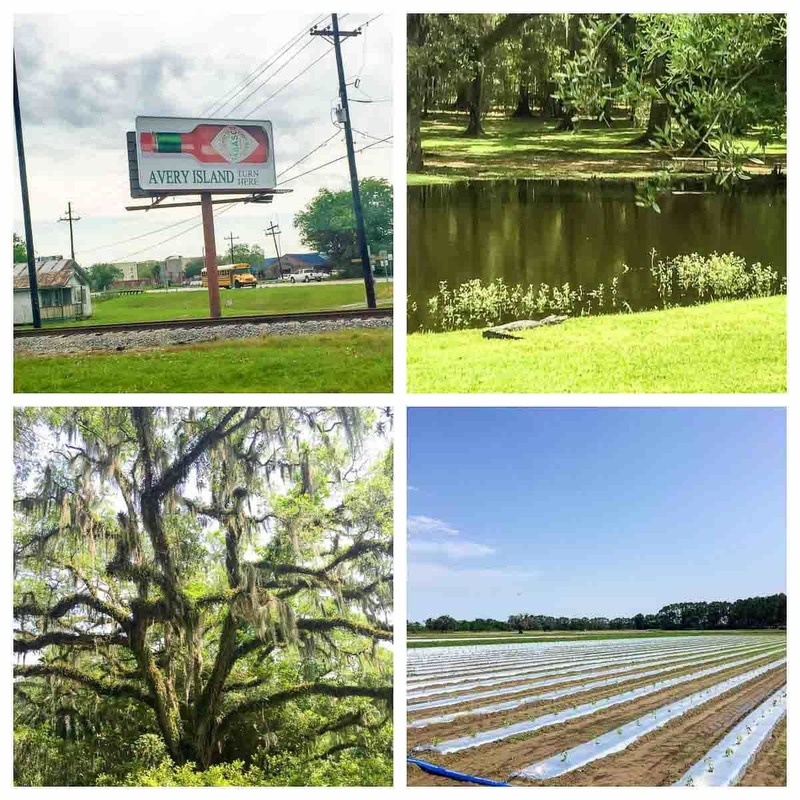 And for fun, here are some images from when I visited Tabasco’s factory, located on a tiny island off the coast of Louisiana, where Tabasco Original Red Sauce has been made the exact same way since it was invented 1868. The company is still family owned. I visited the fields where the peppers are grown, tasted the contents of the bourbon barrels where the peppers are aged for three years before being turned into Tabasco sauce, watched thousands and thousands of bottles whiz by on the production line, and, best of all, met the fantastic individuals, many of whom were second- and third-generation Tabasco employees. This post was originally sponsored by TABASCO (all opinions are my own). I’m resharing it in 2019 and adding a step-by-step video, as it is still one of our favorite recipes. I know you’ll love it too! Awesome seeing the pics again, that was such a fun trip! Love these shrimp sticks too!! These look SO good!!! Simple and summery – yum! Love the recipe and so jealous you got to go to the Tabasco factory! Erin, these look DIVINE. I am in a grilling mood now that the weather is getting warmer, and I think I need to put this next on the “to grill” list! Also, it’s so neat that you got to go behind the scenes and see where Tabasco is made! What a neat experience! hey girl this looks so yummy! Have a great weekend! 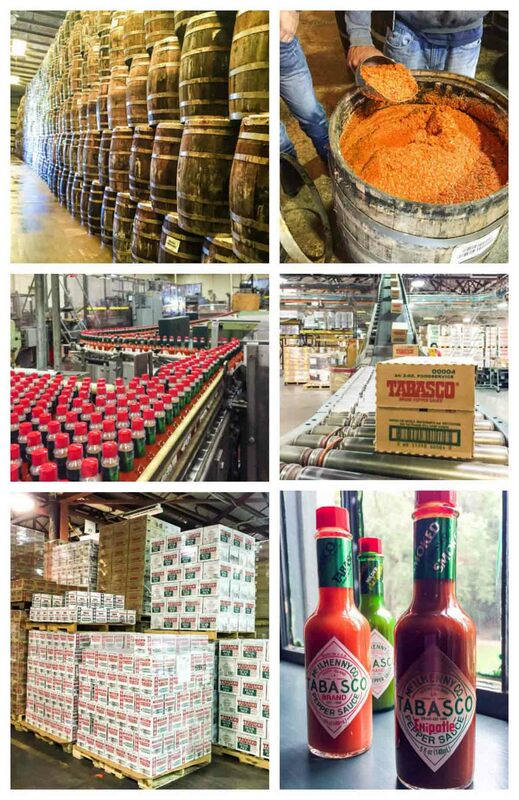 How fun to go see Tabasco’s factory! This marinade sounds perfect for so many things too. Erin, I made these skewers tonight and they were FABULOUS. I’m new to grilling and this has been my favorite experiment so far. My husband does not really like shrimp OR hot sauce (ridiculous, I know! :), so I was curious whether I’d be able to convince him to eat it, and he declared it the best shrimp recipe that he has had. Nice work! Thank you so much for this recipe! I made these, and served them with a curry risoto and it was a real treat! Love your other recipes too! Linde, I am thrilled to hear this!! Thanks so much for trying the recipe and sharing your review. Also, I hope you are having a lovely summer in Belgium. I’ve never been and would love to visit someday! I’m making enough for this to be full course. What sides will go well with this? Hi Christine! You really can serve this with whatever you like. I think a brown rice dish might be nice, along with a green salad or grilled veggies. If you like, you can check out all of the side dishes on my blog here: http://www.wellplated.com/category/recipes-by-type/side-dishes-recipe-type/. Brad, I’m so glad to hear the recipe was a winner! Thanks so much for giving it a try and sharing how it turned out. Hi, can you soak the shrimp overnight. Trying to do as much prep work the night before for a bbq/pool party at the neighborhood pool and want to minimize day of prep. Thanks! Hi JJ, shrimp can get mushy if it sits in marinade for a long time, so I wouldn’t recommend letting it sit overnight. I would try a shorter marinade time (say 30 minutes or so) if you’re looking to cut down on time! Would it be ok to put together skewers ahead of time and throw it into the marinade before leaving the house in a ziploc bag? It will prolly be at least half an hour before we get there and get grilled fired up. I made the coconut pineapple shrimp for the first time and they were a big hit at the bbq. Everyone couldn’t stop talking about them and how good they were especially the heat of the tabasco giving it that kick!! I will make these again!!! I am so happy to hear how much you all enjoyed these Amanda, thank you!! Hi Margaret! I’ve never actually grilled shrimp in the shell, believe it or not! I’d compare the cooking times for the shrimp to those of the skewers in the recipe. If they are very different, you can always do separate skewers, one for the shrimp and one for the pineapple. I hope you have a great time at the party! Thanks for letting me know, Shannon!